Legendary rock band The Who have announced 5 UK dates as part of their ‘Back to the Who’ world tour! 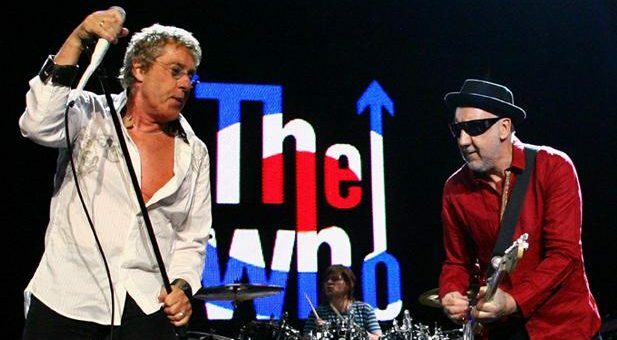 Legendary rockers The Who are back for a special five-date UK leg of their ‘The Who Hits 50!’ tour and will play one night in Glasgow’s SSE Hydro Arena on August 29th 2016. The Who are one of the world’s most iconic rock bands and they’re set to perform in the UK later this year for a special five date leg of their ‘ Back To The Who’ tour. The ‘My Generation’ singers will kick off the UK dates in Glasgow on August 29th followed by stints in Sheffield, Manchester, Birmingham and Liverpool. The Who Hits 50 UK tour will see the band take their audience on an ‘Amazing Journey’ through their entire career from the days of The High Numbers to classic albums such as Who’s Next, Tommy, Quadrophenia, My Generation, Live at Leeds up to the present day. The show which Pete Townshend describes as ‘Hits, Picks, Mixes and Misses’ will see the band play all the classic anthems as well as tackling deeper cuts from their catalogue. Founded in 1964, The Who brought together four different personalities and in effect produced a musical hurricane. Each of them was a pioneer. Wildman drummer Keith Moon beat his kit with a chaotic elegance; stoic bassist John Entwistle held down the center with the melodic virtuosity of a solo guitarist; raging intellectual Pete Townshend punctuated the epic universality of his songs with the windmill slamming of his fingers across his guitar strings; and Roger Daltrey roared above it all with an impossibly virile macho swagger. They exploded conventional rhythm and blues structures, challenged pop music conventions, and redefined what was possible on stage, in the recording studio, and on vinyl. The Who Hits 50 will not only celebrate the fantastic contribution The Who have made to musical heritage in the UK, but also their remarkable contribution to youth culture old and new. Since they formed 50 years ago, The Who have sold over 100 million records. Each of them was a pioneer. As they enter their 50th year the band is still going strong winning rave reviews for their performances of Quadrophenia in 2013. This concert version of Quadrophenia, personally directed by Roger Daltrey, focused on the original album and replaced the narrative used in previous stage versions with powerful imagery projected on an array of massive screens, designed to support, complement and propel the musical content of the work by setting it in the context of the history of the band. The Who Hits 50 show is definitely a rock ‘n’ roll lover’s dream come true, and one not to be missed. Make sure you get your tickets soon!